On Monday Chris had to print some stuff out at the Grad lounge and I had to make sure Enzo didn't destroy the lounge. Since I can't chase him around I went on youtube and searched for Elmo videos. 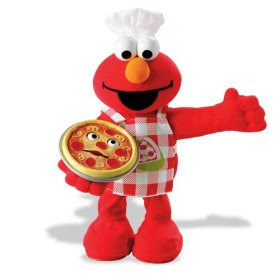 No wonder Enzo thinks Elmo is so cool he has videos with all these artists such as Chris Brown, Goo Goo dolls, Norah Jones, Destiny's child, Robert DeNiro, James Blunt and on and on. I was really getting into all the music videos, maybe even more than Enzo. My favorite was this one by Andrea Bocelli. I'm convinced that if Enzo was this articulate he'd say exactly what Elmo is saying and if I could sing like Bocelli I'd be rich and I guess a man. I'll just take the being rich part. I am making an audio documentary about sleep training. I think I'll use excerpts from this song. What do you think? Do you guys have any other lullaby or songs that talk about sleep that you like. I need to get a rough cut together by Friday. Okay, so that is one of my favorite songs. I guess I'm a real goofball because it always brings tears to my eyes...even when he's singing it with Elmo! There goes any chance I have of being "cool"! It's not bad parenting if it's true. Elmo DOES eat his cereal.